This week we have two gorgeous summery inks for you! 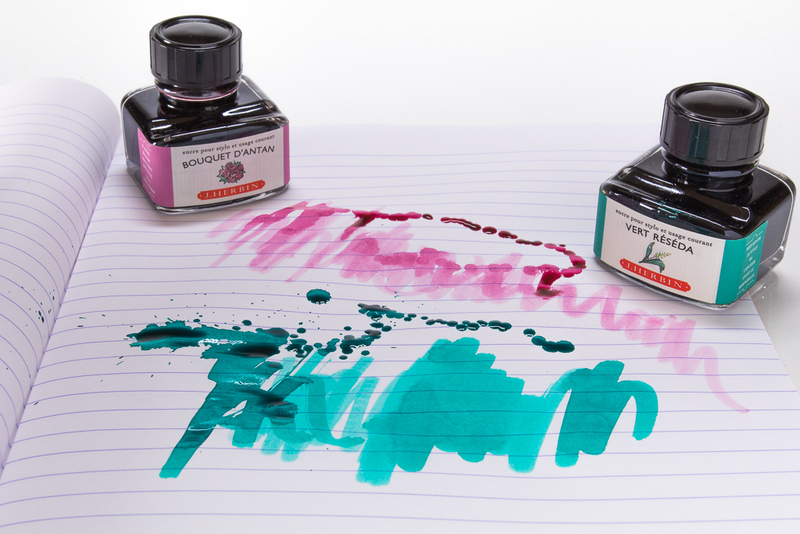 Vert Réséda and Bouquet D'Antan from J. Herbin are two beautiful inks that are sure to make your fountain pen sing! Vert Réséda should be green, but in my humble opinion it's definitely a mint! This gorgeous ink has Mediterranean cool written all over it! The bold ink lays down gorgeous saturation and just a little splash of it lasts many long smears! If you like a bold ink that puts down a great deal of colour, try this ink! Now I have to admit that the first bottle of Bouquet D'Antan that I picked up was lacking purple dye! The muddy grey bottle (manufacturing foo bar) is being relegated to the back of a lonely cupboard in the warehouse where all rejects are hidden! I swiftly picked up another bottle and sure enough it delivered the most subtle purple-pink colour you could imagine. The page ignites with a gorgeous hue but ever so tender tones. If you like an ink that delivers colour, yet washes out quickly yet subtly then Bouquet D'Antan could be the ink for you!